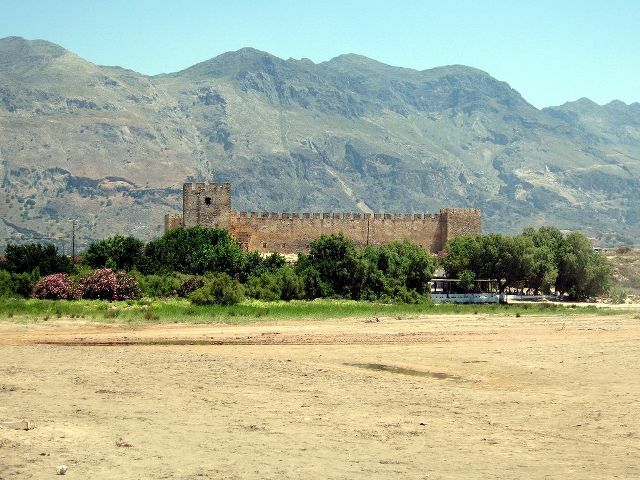 Notes: Frangokastello (Greek: Φραγκοκάστελλο) is the location of a castle and scattered settlement on the south coast of Crete, Greece, about 12 km. east of Chora Sfakion and within the prefecture of Chania. Frangokastello has an extensive, sheltered and gently shelving sandy beach, which has provided the basis for a low key tourist industry in recent years. Tourist accommodation is scattered over the flat plain around the castle, but the area's relative remoteness has discouraged major development.The castle was built by the Venetians in 1371-74 as a garrison to impose order on the rebellious Sfakia region, to deter pirates, and to protect Venetian nobles and their properties. The Venetians named it the Castle of St. Nikitas after the nearby church. The locals, however, who never saw it in a positive light, contemptuously dubbed it Frangokastello, meaning the Castle of the Franks (i.e. Catholic foreigners), Castelfranco or Franco Castello. The name eventually stuck and was adopted by the Venetians as well. According to local lore, when soldiers and builders arrived on the fertile plain to begin construction of the castle, the local Sfakians, led by six Patsos brothers from the nearby settlement of Patsianos, would destroy every night what the Venetians built during the day. Eventually, the Venetians were forced to bring in additional troops and the Patsos brothers were betrayed, arrested and hanged.